I totally forgot the weekend herb blogging last week, sigh what a shame but it’s alright, I have every week to make it up to it. As I will be going back to my hometown tomorrow, for my grandma’s birthday, this post is early, as on today. Anyway, this time I would be introduce a wonderful herb available locally in Malaysia. It is always used in both savoury and mostly sweets cooking. They are green in colour and make your food go green but no they are not vegetables, they are actually, pandan leaves. I have talked bout these pandan leaves before where they were added into our kaya (local coconut jam) as additional flavouring. For me, pandan has the special fragrant smell that is not too strong but yet distinct enough to show its presence while not overpowering the entire dish. Pandan leaves are a favourite in cooking together with rice like nasi lemak (coconut rice), nasi biryani or chicken rice (we locals here usually have our special Hainanese style oily rice cooked with chicken stock and pandan leaves to go with braised or roasted chicken). It will emit an extra fragrant aroma to the otherwise plain rice. Some people might not even realize its presence but will note how much more fragrant the rice is. As for the sweets, we locals like to use it in ‘tong sui’ (sweet soup) and also in ‘kuih-muih’ (local cakes). Chinese had always been real good in tong sui making, we have huge varieties with different types of healing properties. I might blog more about it in future, featuring various tong sui that we usually have in Chinese cuisine, ah it can also be part of my ‘exploring my origins’ project. Well for now, the limelight is on this week’s herb, pandan leaves. I have choices of so many favourites above, but somehow the alluring thoughts of tong sui evaded me and I succumbed to my old time favourite Hak Lor Mai (Sweet Black Glutinous Rice). My grandma use to make this only on occasions, and I would always be thrilled to have a bowful, then another helping, then another and another and…ok, too much! I just love the nutty flavours it emits (though no nuts here), and the crunch of the glutinous rice. Usually, this Hak Lor Mai would be served with a drizzle of coconut milk, freshly squeezed and this is important as it will affect the flavour of the Hak Lor Mai. Some like a lot of coconut milk, some don’t, and I am one who loves my Hak Lor Mai black, just a little coconut milk plus whole load of pandan smell. Ah, bliss. As now I am no longer in my teens where I can have a bowful and another and another without effect, I had become much more health conscious. Though delicious, coconut milk is not good to be consumed in excess. 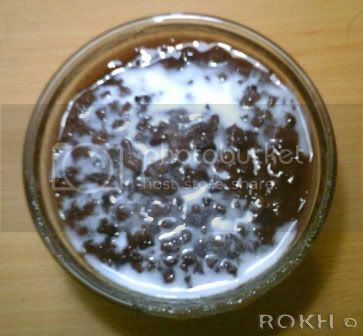 Therefore, I had substituted it with evaporated milk, and I personally like it much more. Though, this is strictly individual preferences, and most would gaps at this un-authenticity. Anyhow, J seems to prefer the evaporated milk version too, oh that vain boy! Dump everything, except the gula melaka and coconute milk, into the slow cooker and put on auto/low for about 8 hours or overnight. 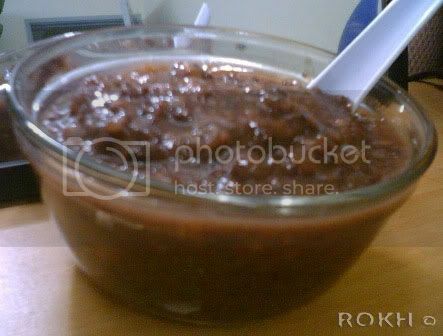 Next, add in gula melaka and cook till dissolved, bout 15-20 minutes more. Serve a bowful of Hak Lor Mai with a drizzle of coconut milk or like me, evaporated milk. This yummy tong sui goes well served warm or chilled. Drain and wash rice the next day. Put rice into rice cooker to cook. Add enough water to cook the rice. When rice is cooked, removed. Boil water with gula melaka, pandan leaves till sugar is melted. Add cooked rice to it and simmer over low heat for 2 hours. Add more water if it dries up. Makes for a person who can finish a bowl, then reach for another, and another, and another and….till the sixth bowl, if still possible 😉 To be safe, share these quickly!